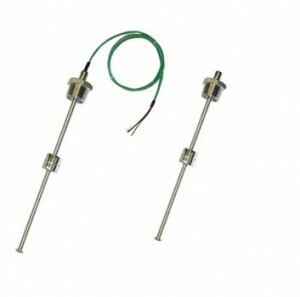 The LFT50 are miniature float level transducers suitable for level measurement in vessels of up to 36 inches in height. Of high quality construction, all wetted parts are stainless 316; other materials available upon request. The use of 1″ or 1-1/4″ NPT fitting accommodates the diameter of the float and allows the units to be installed from the top of the vessel without removal of the float. For fittings 1/4”, 1/2” and 3/4” NPT, the float has to be removed. Upward mounting fittings are also available. Each transducer comes standard with a cable or 5-pin M12 Micro-DC plug. The transmitted level signal is generated via a DIN rail transmitter mounted remotely. Reliable operation and simple design makes the LFT50 an excellent choice for many level sensing applications.